Last week was extraordinarily low mileage due to travel and a few diggers in the shin on the Hardrock course making me sit a few days out to keep my shin healthy for AC. Yet, the lack of miles I ran were more than made up for by the strong lessons I witnessed following the leaders and pacing Chris Price. I'm not going to lie, running the Hardrock course (especially the CCW direction) is really, really, really hard, and there's at least a thousand ways to ruin your day. The course demands good acclimation and strong mountain running abilities, but it also offers up so many threats that normal risks like skipping a gel or taking too much salt are often sharply punished by the course's environment. Example: skipping a gel is almost impossible to make up above 11,000 feet. The body's digestive system shares a limited amount of oxygen and energy with the legs, arms, core, kidneys, brain, etc. etc. If you skip a gel and hope to make it up later, you probably won't. Example: taking too much salt is same idea as trying to take down extra calories. The kidneys are the body's "stomach" for salt. If you try to bank some salt for later, the kidneys might shut down and fail before they pull any oxygen or energy from the brain and legs. When kidneys slow down or shut down, electrolyte imbalances are shot and severe cramping occurs. I saw a few of these examples that would normally be shrugged off on other courses. A runner might chug some extra Coke or sports drink at an aid station or deposit the excessive salt on their clothing. However on the Hardrock course, just hiking along is a struggle for the body, and the perceived effort level is lower than the actual effort level. Chris came into Ouray after almost 5,000ft of descent and was looking to bank some extra calories for the long 5,000ish climb up to Virginus. Vitargo and a number of other performance foods went down nice and smooth giving him a good 500 calorie boost in a matter of minutes. He complained of nausea above 12,000ft and this seemed to be the perfect silver bullet banking calories at 8,300 feet. 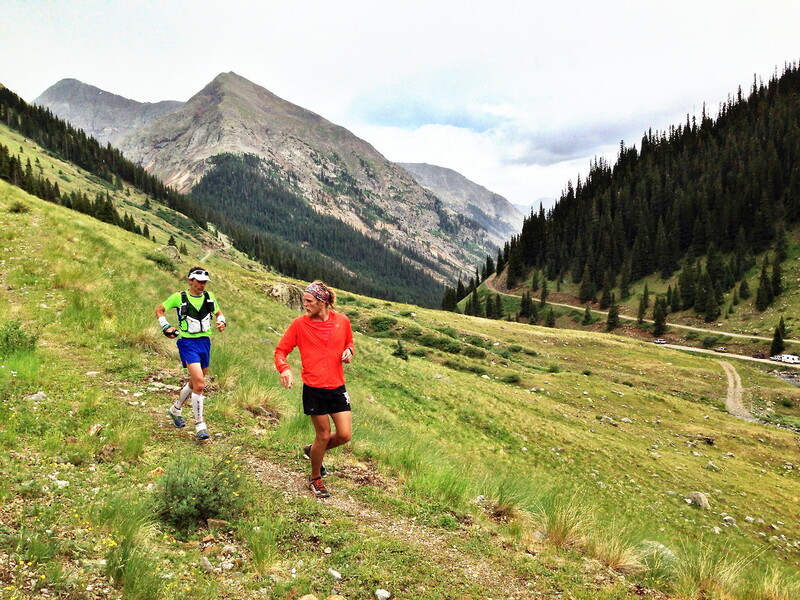 The run up Camp Bird road though deposited the extra calories in the dirt just before Governor's Basin Aid Station. His race went on due to his grit and determination to overcome the circumstances. Pacing Chris later through the night I saw a beast come alive. He was like a Swiss watch opening up gels and chews the second a thought of reminding him to eat popped in my head. He was consistent and unflinching through altitudes that reduced me to a crippled walk the year before. I would've talked more but everything I could suggest he was already doing. The decent off of Oscars was a talus field of casserole size rocks, and I stepped on one propped up against another and flipped a good 25lbs of golden rock into my shin. 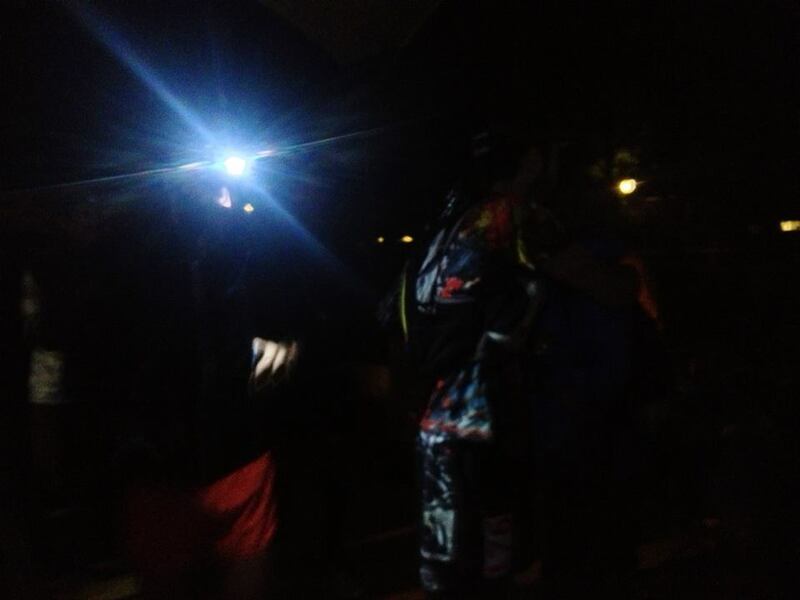 Chris 20 hours into his race tiptoed through the dark without a single mis-step, bombing into Chapman well ahead of his crews best estimates. 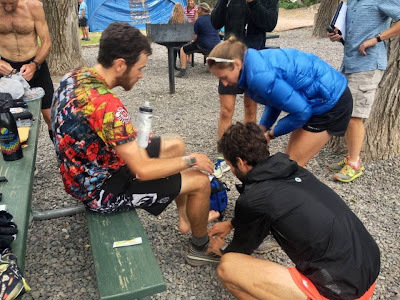 I guess what it comes down to in a mountain hundred is being as sharp as possible with your race tactics while still being as tough as possible when things go wrong. The likelihood of a runner putting down blazing splits while making PHD grade decisions on the fly is simply not going to happen. The best a runner can hope for is to keep it simple, mimic their normal nutrition needs, and be flexible with the worst case scenarios that always seem to come up in 100 milers. My confidence was already high from my 150 mile week before Western, but I felt like giving my body one more semi-hard week putting it under simulated race day stress. Thursday I donned my black waterproof New Balance jacket and ran up to Idlehour, through the canyon to Sam Merrill and down to Lake Ave setting a new world record for sweat drops per minute and running below the CR pace. Friday, Schulte and I got started around 9am to run the first 37 of AC hard and in the heat on record pace, but we only made it to Islip (mi 26) on record pace due an underestimation of the water needed to wash down recovery drink (dehydration by protein). We hiked over Williamson and took hwy 2 to the car at Cloudburst. Saturday I dove into the oven hitting CR pace in the heat from Mt. Hilyer to Chantry (with a warmup from Cloudburst). The crux of Hal's race in '08 was the long, hot climb to Newcomb's Saddle (mi68) where he lost 20 minutes on the record. On Saturday I lost a couple minutes going to Shortcut (much rockier than '89 with out fires), and one minute going to Newcomb, but then made it back on the decent into Chantry. Sunday I already had 107 miles, so I ran an easy 3 miles. I think most people ran more in a day than I ran this week, but I went to Hardrock already mentally tapering. I ran a few miles before I got there and then had a misadventure going up Sultan Mountain with Katie that offered no consistent trail but rather more of an avalanche chute that left deep cuts in my shins from sliding past branches. Friday I took off to let my tender shin heal and Saturday I paced Chris for 10 miles. The rock flipping into my shin meant no running on Sunday and I went back a bit nervous to California. The good news is that in the past 4 days the tenderness has subsided and I've gotten back on top of some great runs. Owen's new album is definitely one of my favorite's to date. Classic acoustic. Thanks again for all of your help crewing and pacing out there! Can't wait to watch AC unfold soon! You're looking more fit than ever and your enthusiasm and energy spillith over, as per usual.